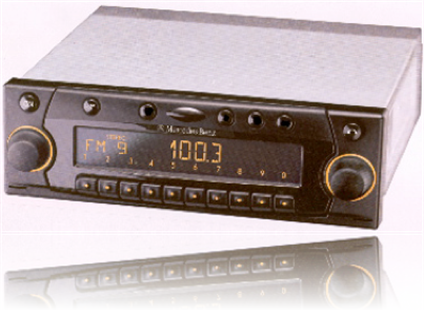 The Model 4602 is an In-Dash AM and FM Radio with Single CD Player. It is a very nice replacement upgrade, and 'plug and play' in many installations. This radio does not support the factory mounted CD changer. For 1981 through 1990 MBs, there is always a single DIN Becker unit in the dash and there is a single wire adapter that allows a clean connection from the 4602 to the old wire harness. However in 1991, the MB radio system is divided into two parts, with a Head Unit in the dash and a separate Receiver in the trunk. This apparently was done to reduce theft of the system and to allow for the CD Changer to be easily tied in (next to the Receiver in the trunk). This configuration ran from 1991 - 1993 and makes it more complicated to install a 4602. In 1994, they made it easy again and the 4602 is clearly plug and play for vehicles from 1994 to 1999. So for the 1991 through 1993 MBs, the antenna lead needs to be extended and you also need to extend the audio output section of the 4602 to the existing vehicle harness. A kit is available that will allow this to be performed. It includes an antenna extension and adapts the existing grey bus cable that currently connects the Head and Receiver together into a method of sending the audio to the trunk. This modification kit from Becker sells for about $100. You can also purchase an auxiliary cable from Becker to run your iPod� through the 4602 radio.